We can understand how people have come to these conclusions. Magazines on the iPad are fun to read and many are coming with a lot of interactive features. But, they are monthly and take weeks to be assembled by the publisher so your reading ‘old’ news when measured in Internet time. Many people… yes, we are right there with you, use NewsReaders on our iPads to pull together news from sources we trust. We launch our reader apps and they reach out to the Internet and pull the latest posts from a variety of sites we have deemed as having the news we are interested in. There is an option to solve the shortcomings of both of the above. 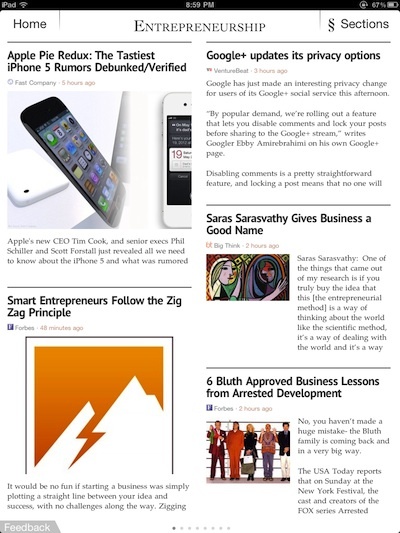 Zite, a personalized iPad “magazine” with smarts. Zite gives you a wide variety of news topic options… thousands of options. If you allow the app, it will look at your Google Reader and Twitter accounts to. Zite jumps right in and starts proving you will news in the areas you chose. Where the ‘smarts’ comes in with Zite is that the app watches what you read and provides content in those areas. Life would be a bit boring if all the news we saw was as we expected. So, Zite introduces news that ‘might’ interest you but is a bit outside of your normal requests. This expands your view and adds spice to the news. 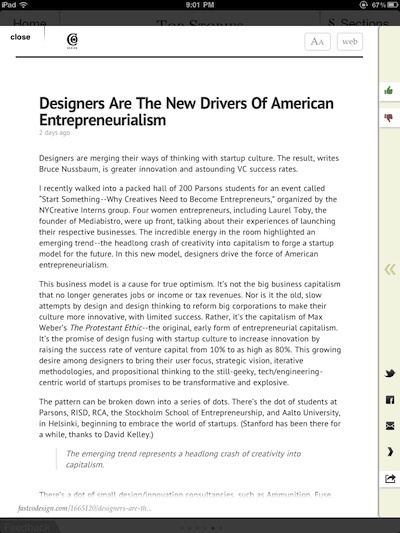 Luckily Zite provides a nice and easy to use interface. Things are as you would expect. A cover page of general news. Then areas of news that you told Zite you like, with each area having content automatically provided that you can sweep through. Jumping from from one news area to another can be done via a drop down through the upper right corner ‘Sections’ option. Choose a short post to read the full article. 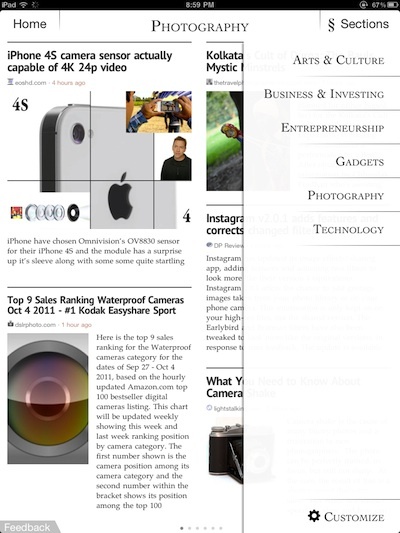 Zite has the features we like down the right side of the page. You can vote the article up/down so Zite can learn. Below that is options to share out over social networks, send a link in an email and save to Read Later. If your interested in digging a bit deeper to what makes Zite unique. We found a podcast in the Tools of Change for Publishing series called “The search for serendipitous recommendations“… a fitting title. 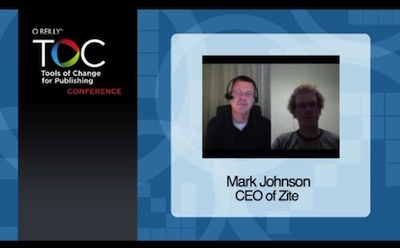 The podcast is an interview of the Zite CEO, Mark Johnson.